Modelled after Versailles near Paris, Schloss Schönbrunn Palace was built in its current form on the peak of Austria′s Baroque glory over the course of several decades in the 18th century. Austria′s mother of the nation, Empress Maria Theresia was the first who decided to make this former hunting chalet the summer residence of the Habsburgs. Pretty facades, formal gardens and a maze; an orangerie green house, a zoo and botanical gardens; facilities for carriages and for entertaining guests at state balls; state apartments and representative halls. 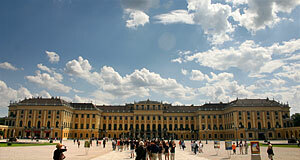 No wonder that these days, Schloss Schönbrunn is the most-visited tourist attraction that Austria has to offer. Before you dive into the Schlosspark, the formal gardens of the palace, enter the building via the blue staircase in the Western wing of Schönbrunn. The palace offers several packages of tickets, I recommend to do the whole thing and spend most of the day in Schönbrunn (how likely is it that you will come back? I have been there only once in my life, and I am Austrian!). Starting the tour, there are nine private apartments of the last proper emperor, Franz Josef I. They give you a sense of the sheer gigantism that the dying empire and its aging emperor suffered from - yet, they are remarkable plain and functional, matching with Franz Joseph′s personality. The so-called "Elisabeth Salon" is named after his wife Empress Elisabeth or "Sisi", widely worshipped in Austria and Hungary for reasons beyond my understanding. Consider the name of this room a tourist-friendly solution, as most of the interiors date back to Empress Maria Theresia - her portrait and the portraits of her similarly ugly, yet numerous sons and daughters can be seen on the walls of the salon. Two of them were particularly famous: Her son an successor Emperor Joseph II (the one from Foreman′s movie "Amadeus") and Marie Antoinette, wife to Louis XVI, who was executed on the guillotine. Note that all the ladies on the portraits look remarkably similar - painters tried to "even out" unfavourable features to idealise the look of the royal family. The next room is a representative hall, the Spiegelsaal ("mirror hall"), copied straight from Versailles. This is the hall where Mozart performed his piano-skills to the royal family as a seven year old boy in 1762. According to a letter by his father Leopold, little Wolfie Mozart fnished his performance by running to the Empress (obviously recognising that she was the main one), jumping on her lap and kissing her. Cross the "Kleine Galerie" and the "Große Galerie" to marvel at some of the Habsburg′s Chinas alongside with furniture and other interiors. The Zeremoniensaal or "Ceremonial Hall" is a representative hall with five large paintings. Next doors, you can see the Blue Chinese Salon, where Emperor Karl I signed a document stating that he would not interfere or participate in state affairs - a phrase used to avoid a formal abdication, in November 1918. This marked the collapse of the empire and the end of the World′s oldest dynasty in office. Following the blue, the next room has a black theme with black-and-gold lacquer decors, just the way you know it from Chinese furniture. The so-called "Napoleon Room" is the place where Bonaparte was thought to have slept during his two stays in Schönbrunn. Another porcelain room follows, although most of it is carved and painted wood that just fakes to be porcelain. Tour guides will make you guess which pieces are made of real porcelain. I looked it up, but won′t tell you. The next hall is called "Million′s Room" and is the most expensively equipped hall of Schönbrunn. The name refers to the million silver coins that Empress Maria Theresia paid for the interiors. Continue with "Schloss Schönbrunn - Part II"